Circular migration: A “win-win” solution? Participants in the workshop on circular migration at UNU-IIAOC in Barcelona. Photo: UNU-IIAOC. 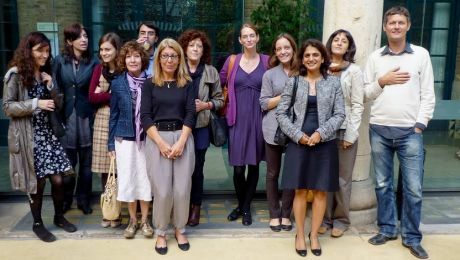 International Institute for the Alliance of Civilizations (UNU-IIAOC) held a workshop in Barcelona on circular migration. This workshop launched a book project on the named theme, in partnership with the UNU Institute for Comparative Regional Integration Studies (UNU-CRIS) and the Center of Studies and Research on Migrations at the Universitat Autonoma de Barcelona (CERM-UAB). The event represented the inaugural workshop for a new pilot project: “Win-win-win” or zero-sum”? The Implications of Circular Migration for Integration, Human Rights and the Alliance of Civilizations. The project aims to critically analyse circular migration from multi-disciplinary perspectives, with regard to global human, political and civil rights implications. The closed workshop brought together a diverse group of selected experts from around the world to discuss different case studies illustrating circular migration patterns and policies in multiple regions. Circular migration refers to the “back-and-forth” movement of people between countries and regions. It forms part of the changing nature of migration movements worldwide at the beginning of the twenty-first century. Despite growing interest in the topic — and its increasing role in global migrant flows — the scholarly study of circular migration is still in its early stages. More research is needed to fully grasp its social, economic, political and cultural implications. This need has become even more relevant, as the idea of circular migration is increasingly heralded by policy makers as a solution to transform international migration into a “win-win-win” situation, where destination countries can successfully meet their labour market needs whilst sending countries benefit through remittances and know-how, and migrants themselves can raise their standard of living without leaving their families on a permanent basis. What are the theoretical and methodological underpinnings of circular migration? Which kind of circular migration patterns do we find in different world regions? What socio-economic, political and cultural implications do circular migration processes have for migrants and policy makers, as well as for the societies of origin and destination? What challenges does circular migration pose for the social integration and citizenship of migrants? How do circular migration practices enhance intercultural dialogue and reinforce alliances between civilizations? The workshop in Barcelona enabled participants to discuss in detail the selected case studies as well as research outcomes. Research outcomes will be published as a book by UNU Press at the end of the pilot project, which will conclude in the second half of 2012.